Well, it’s a convenient excuse for not blogging for so long! Just imagine the usual excuses (traveling, working, prepping for holidays) x 10. Working on web content as a day to day job makes me pretty sick of hunching over my laptop, staring at a screen all the time. When I had the flexibility to take some time off over the holidays, I did _not_ want to go near my laptop any more than was necessary. I was pretty industrious over the holidays, too. I made a sweater jacket — from cast on to blocking — in about 10 days. It was my holiday gift to myself. This jacket is really warm. It’s made with Noro Kocheron, which is a blend of wool, silk, and angora. I’d picked up an entire bag of 10 skeins at the very last minute during Stitches Midwest this past August, and thought that I may felt with it. But, I liked the idea of using the yarn’s striping to my advantage by making a sideways-knit project. 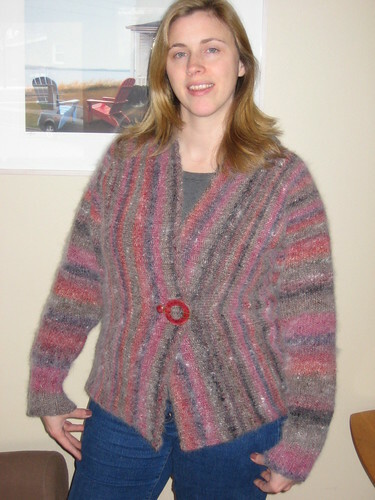 I happened to have the pattern for Lara from the Debbie Bliss Alpaca Silk pattern booklet (the first one), because I had admired this jacket on a fellow SnB member about a year ago and ordered it for myself. So, when I got the itch to make a sweater over my holiday time off, all these things fell into place for me at just the right time. Up until last week, we’ve had such a freakishly warm winter that I thought I’d never get a chance to wear it. But, now the weather has shifted and I’m actually getting a lot of use out of this sweater. In December I got a bit of a break from all the work travel, but it’s started picking up in January. Last week I was in New York City from Monday until Friday. This is maybe the 8th business trip I’ve had to make to NYC in the past few years, and I finally am getting to appreciate the city a bit. I had last Thursday evening free, and I did something very unusual for me: I attended a musical theater performance. Well, here I was staying and working in the Theater District all week and walking by these theaters every day on my way from hotel to office and back again. So, I decided to ask my friend Adrienne (who has herself performed in several musicals) for a few recommendations. I had literally 5 minutes to stop at a theater and buy a ticket before meeting some colleagues for a drink, and since I was walking right by the Walter Kerr Theatre, and it was one of her recommendations…well…I went to see Grey Gardens. I loved the whole experience. The theater was a lovely gem, and I felt so connected to the performers in that small, intimate setting. (Well, compared to the cavernous auditoriums that we call theaters in Chicago, it was pretty small and intimate, even though there were at least 200 people in there.) The performance was compelling and the story was wonderful: funny, sad, and really moving. Yeah, I had a few tears in my eyes at the end, but I wasn’t depressed by it or anything. By the time the performance was over, it was after 10:30 PM and I hadn’t eaten anything for dinner. So, I stopped by one of those little Asian delis and picked up some salad and a beer, then headed back to the hotel. Now I certainly couldn’t have done that in Chicago! I really felt like I was in a dream sequence or something that night. Walking along Broadway, with all the lights and people about…on a buzz from such a lovely experience at the theater…able to find a decent selection of food at such an odd hour…Now I see why people love New York City. What do you think of this new Blogger template? I like the new Labels; it’s something I really wanted from blogging software and I’m glad they’ve added this functionality. We had two glorious days in Big Sur. Yes, I made the drive and didn’t totally break down or kill us (obviously). Driving down to the Big Sur Lodge was pretty difficult for me. When we got to the room, I had to lay down for an hour even though it was only the middle of the afternoon. That night, I crashed at about 8 PM and slept straight through until 7 AM the next morning. All that anxiety around the drive really sucked up a lot of my energy. But, I did get used to the drive and get a bit better. On our return drive back up north, I barely had a twinge as we approached Bixby Bridge, whereas on the drive down I nearly hyperventilated when I saw it. Mark took many photos with his much better camera, but I have to wait until we get home to upload them since he forgot to bring his transfer cable. We went to Esalen on Sunday for massages and a dip in the baths. The natural hot-spring baths are right on the edge of the cliffs, and the view is truly stunning. Massages are given in the same place, and it was an incredible experience to be listening to the surf below you, feel the sea winds, and have such incredible body work at the same time. It also leads to a bit of interesting mind tricks to get totally naked with a bunch of strangers and share a hot tub. But that’s another story…Will I sound like a total granola crunching idiot if I say that Esalen was a spiritual experience for me? Today is our last full day, and we’re going off to the Monterey Bay Acquarium and Cannery Row. 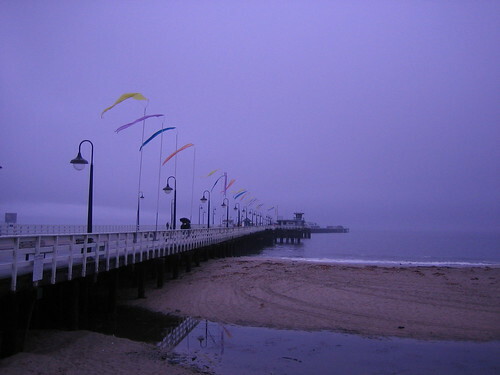 Santa Cruz Wharf on a grey, rainy morning. 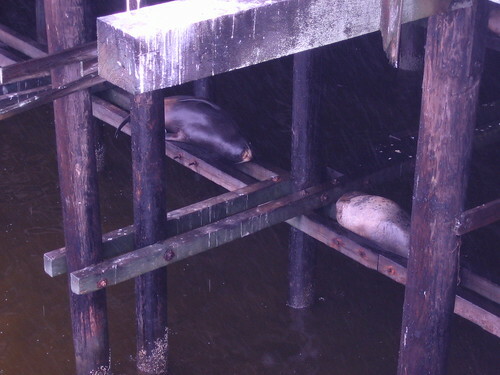 Sea lions “bunking” under the wharf. I was totally delighted by the sea lions under the wharf. I think Mark was pretty bored by it after a few minutes, but I walked around the pier listening for their “barks” and peeking at them. We also visited a winery tasting room in Felton and got lost trying to get to Bonny Doon winery. Mark’s mobile phone signal died, and with it the GPS directions/locator. We were on a little twisty road in a mountain pass in the middle of the redwoods. I guess it would have been pretty cool if I weren’t a bit freaked out by the smallness of the road and the fact that we were hugging a mountain. Good practice for Big Sur, which I will attempt to drive to tomorrow. Mark is flying in tonight and we’re heading to the coast. We’ll start out in Santa Cruz then head on to Big Sur. I’m excited and scared that I’ll be driving along Highway 1, perched above the rugged Pacific coast line and hugging a mountain. I hope my fear of plunging to my death from a great height doesn’t cause my hands to tremble so much on the steering wheel that the fear becomes a reality. If we survive the drive to Big Sur, we’ll stay there for a few days before heading back up to Monterrey, and then back home. I’m also hoping the weather holds out, because it is getting cloudy here and there is a chance of rain almost every day. 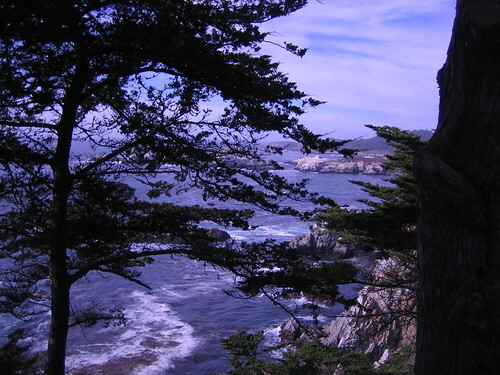 I don’t want to be slogging through a downpour while hiking around Big Sur. Geez, I sure can find lots to worry about, can’t I? 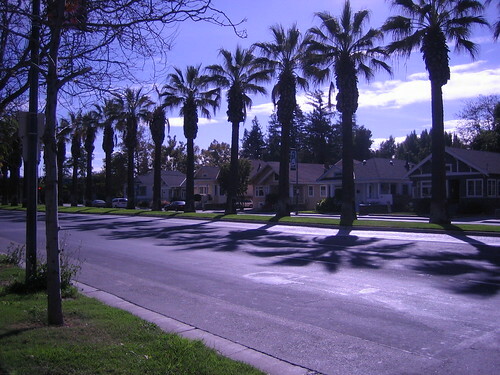 I’m not sure if I’ll be blogging, but as I get Internet access I will be uploading photos to my Flickr account. Now, on to lunch and final sessions of the conference!